As I have mentioned in my previous posts, I am traveling to Colorado to help a dear friend celebrate her big "4-0". Along with the Camellia, I thought I would make her a korknisse. 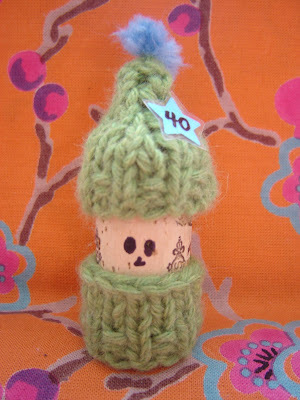 After drinking her celebratory bottle (o.k., bottles) of wine I will pop one of the corks into the sweater and hat so that she can remember her special day. 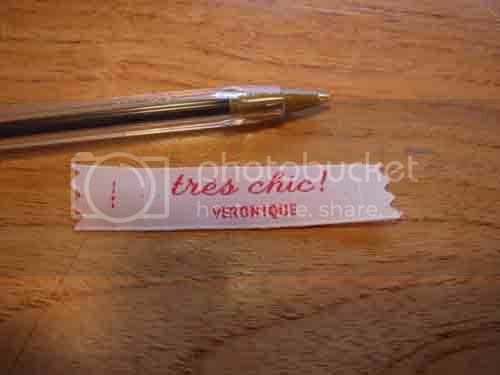 I originally saw these on Elliphantom when Elli made several for Christmas gifts. I added a little star with a "40", and hope this little guy sits on a shelf and collects 60 years of dust! They were so fun to make, I decided to make 3 little guys to symbolize my 3 little guys. (2 guys and a gal) :) Sitting at my kitchen window, they really do make me smile. The pattern can be found here. 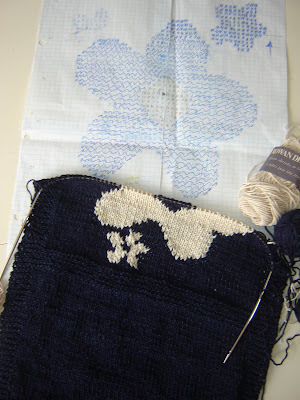 Libby and I charted out her flowers for her messenger bag, and this is what will be knit on on the plane. Can you imagine an airplane ride without the kiddos? 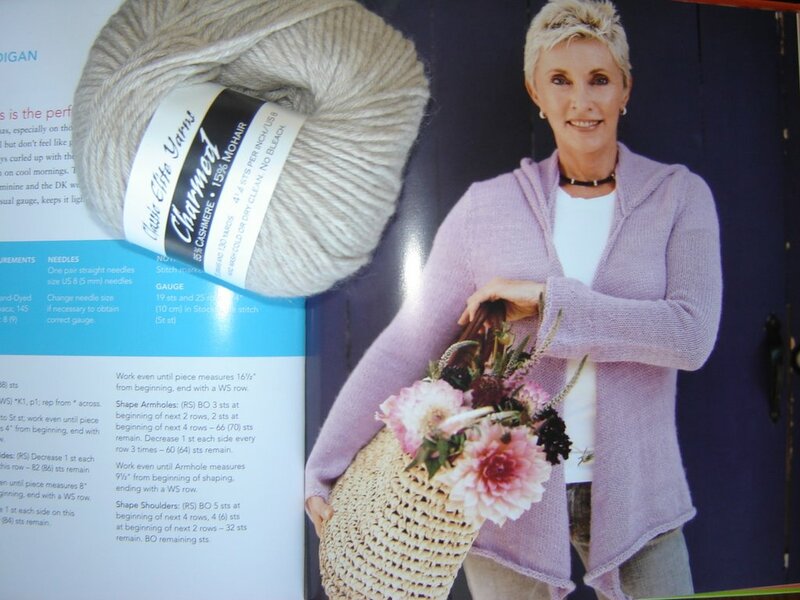 Sounds like quality knitting time to me! 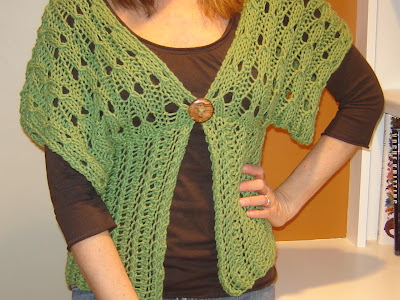 I finished the Slouchy Cardigan, Love it, and will post pictures when I return. 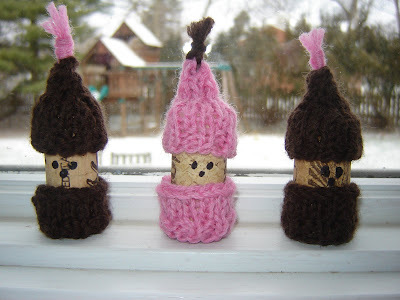 Those corks are really cute! 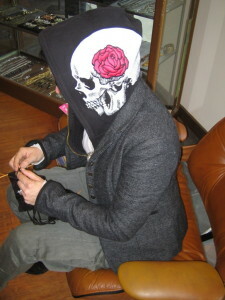 I might have to make a messenger bag for my girls too - love that flower! WE CELEBRATED OUR 14TH WEDDING ANNIVERSARY YESTERDAY. WE HAVE KNOWN EACH OTHER FOR CLOSE TO 30 YEARS. SHE IS THE MOST WONDERFUL GIRL IN THE WORLD AND I LOVE HER WITH ALL OF MY HEART. Little cork people! So cute! Can't wait to hear about your trip. Did she like the sweater? I'm sure it was the hit of the weekend. How many cork people do you have to make? TOO FUN? 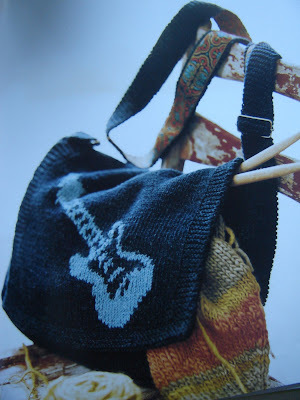 I have never understood felting or the desire to make your own handbag, until I saw that messenger bag with the flower!! How cute!!! And if you are in Denver and want a little out of town yarn/crafting fun - try the Lambe Shoppe - wonderful fun shop with good help (and Coppelia's - she is a little crazy but the yarn is amazing) and fancy tiger for the most interesting crafting supplies, books and local stuff.